It’s easy to think of startup marketing as completely spend-driven: companies come up with a product, and then dump millions of dollars into ads. This goes double for consumer tech startups. It’s easy to fall into the cycle of paid advertising addiction. That’s one reason why it’s good to pay attention to the subtle tactics that are working on the organic side, too. Fitbit is a wearable consumer tech company that’s known for their fitness tracker. In fact, “Fitbit” is almost synonymous with their own product category—similar to how consumers use “Kleenex” as a catch-all term for facial tissues. So you might think that Fitbit doesn’t bother investing in organic content marketing. But you’d be wrong. Fitbit also runs a robust healthy living blog, covering topics like diet, sleep, and exercise. In fact, the Fitbit blog gets more than 155,000 organic visits per month. If you were to try to drive their organic traffic to your site with PPC ads, you’d spend about $140,000 every month. That’s a valuable blog. And we’re going to take a close look at the one post that’s driving the most organic search traffic for them. In January 2018, former cookbook editor Becky Duffett hit “publish” on a 7-day weight-loss meal plan. And in less than a year, the post became the Fitbit blog’s SEO champion. 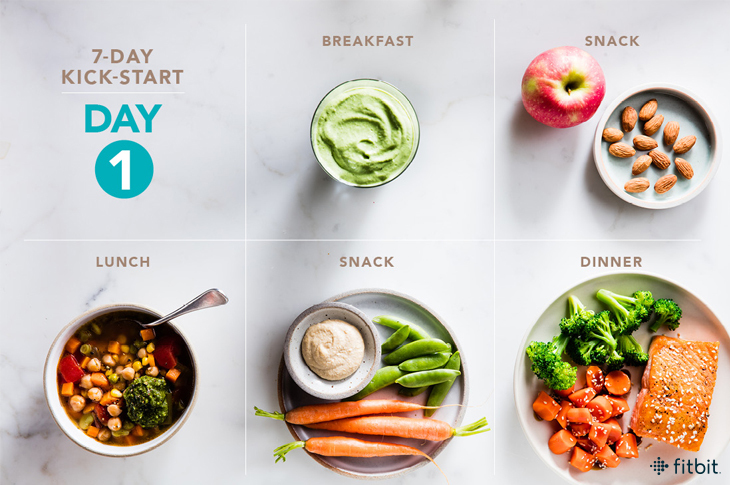 The post gives readers a day-by-day breakdown of a one-week healthy diet plan. It’s aimed at people using Fitbit, but you don’t need a Fitbit to get value from this post. This single post attracts about 13,000 visits from organic search every month. That’s about 15% of their organic search traffic. And this search traffic is pretty valuable—Ahrefs estimates that traffic’s value (the amount you’d have to pay to get that traffic via PPC) at $51,000 per month! That’s one killer blog post. We took a dive into the post to see why it’s doing so well, and what you can learn from Fitbit’s success on this front. It would be tempting to turn a blog post like this into a long ad for the Fitbit tracker, but that doesn’t happen. The whole post is focused on giving people what they came here for: a simple weight loss meal plan. It’s common to find recipes and meal plans with long, fluffy intros that don’t really provide any value to the reader. This blog post doesn’t fall into that trap either. The preamble, including disclaimers, is on the long side—it takes up about 20% of the article. The meal plan itself doesn’t begin until about 260 words in. That intro could probably be cinched up a bit, but the preamble isn’t off-topic—it’s all information that should help the reader make the best use of the meal plan. Interlinking your content is a smart SEO move. It gives search engines signals as to what your content is about. It helps readers find more of the relevant information that they might want or need to better understand the material. And by inviting people to look around your site, you can lower that bounce rate, too. Becky Duffett did a great job on this one. 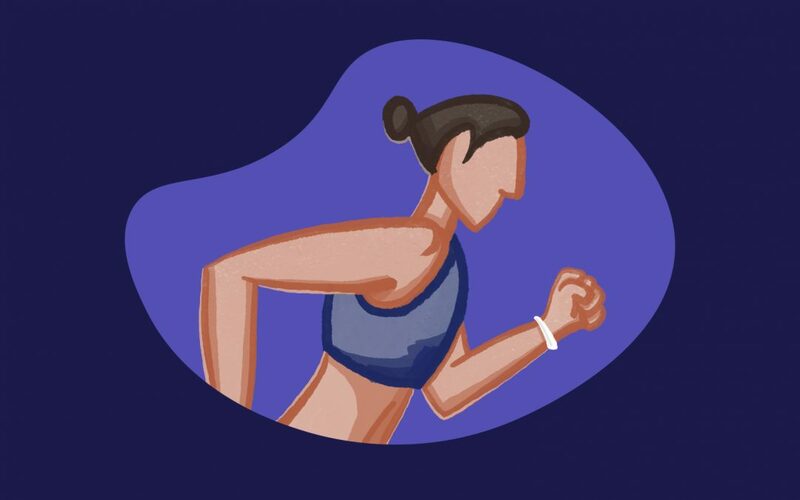 This post gives the reader plenty of links to other helpful articles on Fitbit.com, and even refers to some offsite authoritative academic material. 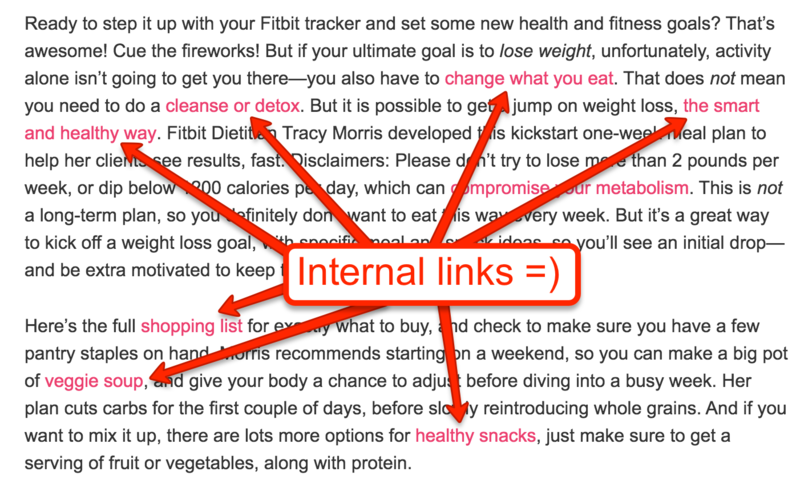 It’s not always easy to keep track of your internal links, but Fitbit does it splendidly in this article. The photography in this post is fantastic. Every day’s menu is presented in a way that makes the food look tasty. It’s a given that food should look appealing, but from an SEO standpoint, this is an important move for a few reasons. By making the meals themselves look appealing, the images reinforce the value of the content. They make the meal recipes easier to picture (and take in), which helps readers visualize what they’ll get from following the instructions. That’s smart, because readers won’t truly experience the value of this post until at least a full week after reading it. Pictures short-cut that value experience—which should keep readers more engaged on the page. Light, eye-catching images spread easily on Pinterest. As of July 2018, this post has been pinned more than 600 times. Pinterest gets overlooked when it comes to SEO strategy, but it’s helpful to remember that the platform functions as a search engine for visual ideas. Google wants to serve reliable, authoritative information to searchers. Nutrition is a treacherous content jungle: anyone can write anything about what foods you should or should not eat, and following bad nutritional advice can have negative consequences on searchers’ health. So I’m not very surprised to see that an article written by Duffet, a former Williams-Sonoma cookbook editor and a graduate of San Francisco Cooking School is climbing the Google ranks so quickly. It helps that Duffet collaborated with Tracy Morris, who earned a master’s degree in nutrition and dietetics, is an Australian Accredited Practising Dietitian, and is an international member of the Academy of Nutrition and Dietetics in the US. Other meal plan blog posts (like this and this) rank, and are composed by registered dieticians. But these posts live on media company blogs, and are rife with banner ads. While other sites are trying to drive ad impressions, Fitbit is just giving readers what they’re searching for. Fitbit could publish (and link to) complementary posts. The comments section has numerous requests for vegan and vegetarian alternatives to this 7-day meal plan. These posts would provide futher interlinking opportunities, both to this post and others. FitBit could create a printable chart for this plan. 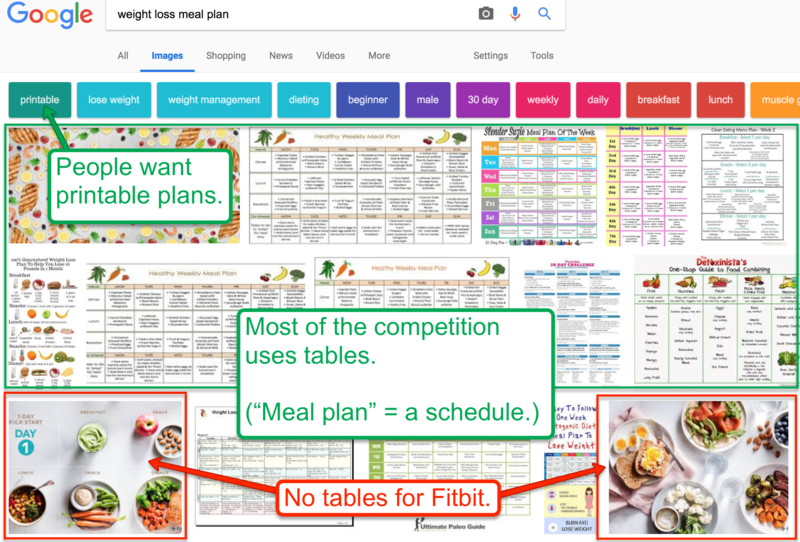 If you do a Google Image Search for “weight loss meal plan,” you’re met with a parade of print-friendly charts and tables. This makes sense—when people think of a 7-day meal plan, they think of a schedule involving 7 days. A calendar-esque layout of meals makes sense as a printable meal plan. Based on the GIS competition, Fitbit would probably gain more traction by adding a table to this post. Fitbit could secure their featured snippets with some formatting. 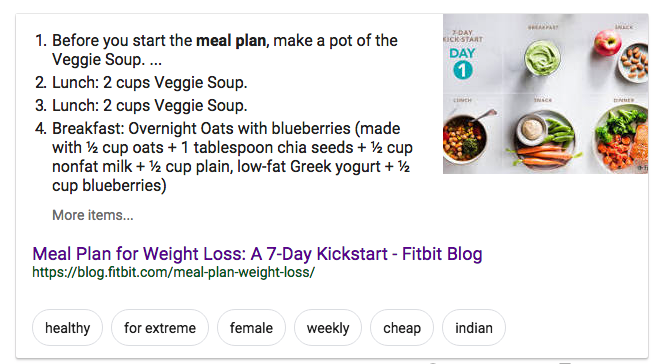 Right now, they occupy Google’s featured snippets for several lucrative keywords, including “weight loss meal plan.” But if you look closely, the featured snippet is … less than intelligible. Step 1: make a pot of Veggie soup. Step 2: eat it for lunch. Step 3: eat it for … lunch again? This isn’t Fitbit’s bad; it’s Google’s. But Google’s not going to keep a nonsensical snippet forever. Eventually, their robot will flag it and find something better. This blog post is an impressive one—it’s already shot to the top of the search results in less than a year, and it’s occupying some competitive space. Plus, it’s attracting the kind of people who are trying to start living a healthier lifestyle … which makes them prime candidates for buying a Fitbit soon. You can do the same. Find the problems your market faces, and help them solve those problems by making Free, Helpful Stuff. This post from Fitbit sets a fine example—you can do this, too.